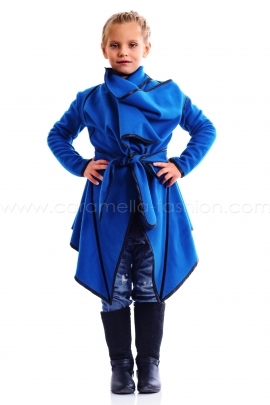 Asymmetric sleeveless eco fur hem poncho coat - Cashmere fabric- Wide collar Washing Instructions: Delicate Program recommended Composition: 95% cashmere, 5% polyester The price of sizes for 11 and 12 years old girls is increased by 20%. adequate and appropriate model for the figure of the girl. Of course, during the selection many additional factors will influence your choice such as your taste, as well as the preferences of your young lady; color range, additions and decorative elements, presence or absence of other outerwear in the wardrobe, the age of the future possessor of the clothes. As a general rule, girls are quite neat and they prefer clothes approaching maximally to those of their moms’. At the same time, they do not make any compromises with the convenience and the comfort of wearing. It is compulsory that you comply with this if you want that your purchase is appropriate. 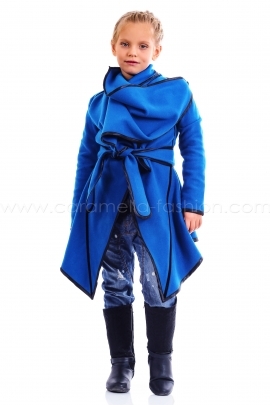 The kid’s coat is a classic. It is admired and loved, and regardless of the fashion trends, it always has a reserved place among the favorite clothes of the little girls. They feel elegant and stylish in it, and of course beautiful. Furthermore, good vision it is not to the disadvantage of the functionality. On the contrary – the modern fabrics used do not let in the cold wind and the moisture. They retain around the body a layer of warm and dry air that provides high thermal comfort. At the same time, the fabrics breathe and do not allow brew. Flexible fabrics do not restrict the movements and they increase the wearing comfort. They give the girl’s silhouette softness and grace that young ladies unmistakably recognize and highly appreciate. 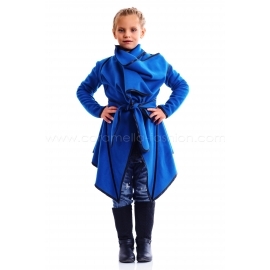 Even the most playful little girls do not mind from time to time to change the unassuming jacket with a soft, warm and cozy overcoat. Because we have proved that clothes made by us are distinguished by their quality, originality and functionality, together with reasonable prices and a specially developed bonus system which makes each of your next purchases more profitable. Copyright models which we develop and sew of fine fabrics – with preference to cashmere. They are with a modern cut and up-to-date decorative elements, adapted to children’s typical radiancy. We use appropriate garnishes to add personality and memorable vision to each child’s garment. It is indicative that the first clients of our online shop are already buying from us for their little daughters. Join us! Choose a suitable model and bring joy to your little girl!